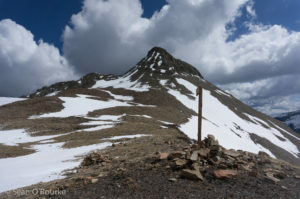 After some atypical hot-springs-related program activities, I left Renée to tag some peaks in the La Plata mountains west of Durango. Though not as high as their neighbors to the north and east, they are still striking from the south and west, enough so that the highest, Hesperus, marks the northwest corner of the rhomboid Navajo ancestral homeland. Being greedy, I planned to start with Sharkstooth, then traverse my way around to Hesperus via Centennial and Lavender. I retraced my route to near Mancos, then took off on the long forest service road northeast toward Windy Gap. The road started out as nasty fresh chip-seal, then became nice dirt as it climbed through scrub, pines, and aspens, passing a guard station before a snowdrift stopped wheeled vehicles near Spruce Mill Park, a few miles short of the Sharkstooth Pass trailhead. I strapped snowshoes to my pack, then set off up the road, finding surprisingly consolidated snow made even firmer by frequent snowmobile traffic. Once off the main road, the snowmobile tracks went in all directions, and I followed one for awhile before setting off for Sharkstooth’s southwest side, surprised to only posthole a few times on the untracked snow. 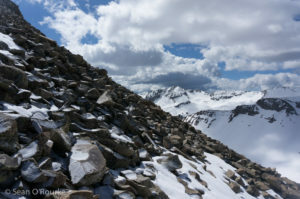 Though the snow was well-behaved, the underlying rock was not: as I started up the bare slope to Sharkstooth’s summit, I ran into large, loose talus covered with a dusting of fresh snow. I slowly worked my way up the peak, trying various lines and finding none particularly pleasant, and concluded that the peak is best done completely in snow. Perusing the register on the summit, I was surprised that many people complimented the view, but none commented on the slog. Maybe I complain too much. I descended Sharkstooth at about the same pace I climbed it, then followed bits of trail toward Centennial from Sharkstooth Pass. When the trail disappeared, I followed the easy low-angle snow along the ridge to the summit. So far, so good. The ridge to Lavender looked tricky, but I had plenty of energy and daylight to work with, and doubted that these minor peaks would present much of a challenge. 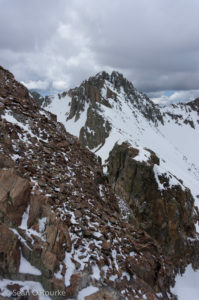 Descending southwest, I found an unfortunate, tricky mixture of hard, steep snow, loose scree, and rotten rock. I would have felt better taking to the snow with crampons and an axe, but I had only running shoes and snowshoes, neither especially useful, so I stayed near the crest, avoiding the precipitous east side. I was making slow but steady progress until I reached a notch visible from the approach, and found the near side vertical to overhanging. There is apparently a way around in the summer, and I could probably have descended around the west with better snow gear, but I didn’t see anything I liked, so I retreated to Centennial, then cut the corner back toward the road. I probably could have climbed Hesperus from the north, but that would have required 2,000 feet more climbing, the snow was beginning to soften, and the weather was sort of getting worse. After snowshoeing back to the road, I hiked and jogged back to my car semi-defeated, then headed into Mancos for a resupply before leaving peaks and snow behind to dry out in the red deserts of Navajo land.